The Bank of England has come under fire for any number of issues over the past few years, perhaps unfairly. But the latest issue is very much a case of the Bank shooting itself in the foot. 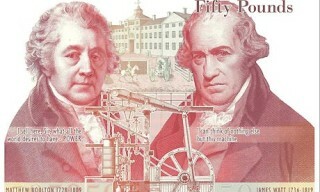 Equality campaigners are outraged that, with the replacement of Elizabeth Fry for Winston Churchill on the new £5, no women are featured on any bank notes. After a feature on today’s PM on Radio 4, the petition to redress this now stands at over 25,000 signatures. The Bank clearly has got this one wrong. But they’ve got the £50 note right. James Watt, of steam engine fame, is honoured. But alongside him is the far less well known but arguably more important Matthew Boulton – his commercial partner.